Western Connecticut State University’s Homecoming Week Street Fair held on October 7th at the Westside Campus had passersby hopping — or should we say hooping, skipping, and jumping down to The Echo’s table for a good time. Not only was there an abundance of food trucks, booths filled with activities, and bouncy castles, but thanks to The Echo, hula hooping contests were in full swing. As far as the victors, there were some seriously nostalgic goodies to be won. Slinkies, mini paddleball, bubble wands, and Play-Doh were only a few of the addicting childhood-reminiscent handheld gadgets given out during the Street Fair event. Students, staff, friends, and family members of all ages alike were eager and excited to participate in hula hoop contests to win these 90’s inspired throwback trinkets. In addition to the youthful, colorful toys, other trinkets such as fidget spinners, gel pens, and tiny hats were also offered as grandiose rewards to be won. Even WCSU’s mascot, Colonial Chuck, joined in on the festivities; regardless of being unable to fit into any of the three hula hoops The Echo supplied! With the new university semester in full swing, students are busier than ever between class time and the workload. Any and all leisure time is cherished with such packed schedules, and a break like Homecoming Week is always an enjoyable opportunity to get college goers outside and exploring what Western has to offer. By attending the street fair, The Echo crew’s hoped that with the help of their vibrant, neon colored knickknacks and flashy prizes to bring a splash of fun color and bittersweet nostalgia to the WCSU community. 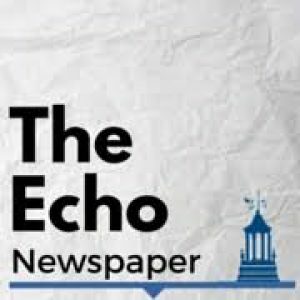 Furthermore, they also intended to bring awareness to the fact that the student-run newspaper is regularly searching for writers and contributors to The Echo, as well as introducing its lively club members to their intended and potential audiences. Each person who passed by the club’s table was informed The Echo being a student-run newspaper offered exclusively online, and that anyone would be welcome to be a part of the sixty-two years (and counting) of publications at Western Connecticut State University.